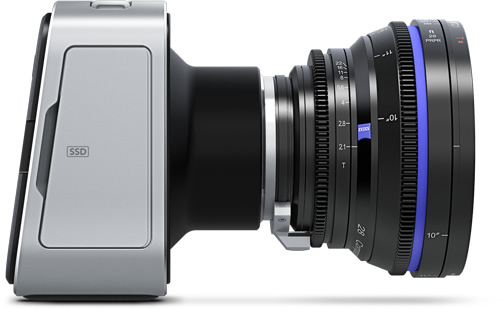 Blackmagic Design exposed a new camera at NAB: Blackmagic Production Camera. Just forget the fact that they don’t have fulfilled all their obligations concerning the Blackmagic Cinema Camera yet and look at the specs and facts of the new one. BMD claims that the BPC is world’s most portable digital film camera that delivers 4K. It comes with a Super 35 sensor, global shutter and the user will be capable of using his or her beloved EF mount lenses. It records lossless compressed CinemaDNG as well as Apple ProRes 422 (HQ) and has a built in touchscreen just like the BMCC. Focus Focus button turns on peaking. Iris Control Iris button automatically adjusts the lens iris settings so no pixel is clipped in film mode. Scene average auto exposure in video mode. Lens Mount EF and ZE mount compatible with electronic iris control. SDI Video Output 1 x 6G-SDI 10-bit 4:2:2 with choice of Film or Video Dynamic Range. Analog Audio Input 2 x 1/4” jacks for professional balanced analog audio, switchable between mic and line levels.